Dr. Josh Axe is probably known by anyone who has ever done an internet search for the health benefits of a particular supplement. His pages usually rank right at the top. He’s not just a total babe (I can’t be the only one who thinks that) he’s also a licensed chiropractor with a full line of health supplements and a prolific website that gives sometimes controversial information. Some people criticize the health advice he offers people, while other people swear by his methods and the lifestyle he advocates. I tend to fall somewhere in the middle. I like many of the things he says and am skeptical of others. Because of the controversy many people request Dr. Axe Collagen Reviews and Dr. Axe Collagen Protein reviews. That’s why I decided to do an independent review of the Dr. Axe Multi Collagen All-in-one supplement so you can get an outside perspective on it. This is the first Dr. Axe product I’ve ever purchased. For general information about hydrolyzed collagen and the best collagen supplements go to my main page about the best collagen peptides supplements available. Collagen types serve separate purposes within the body. Types I & III are found in many of the same places in the body and are therefore often taken together to benefit muscles, skin, hair and nail growth, and strong bones. Type II collagen is involved in the cartilage and joints. It is sometimes recommended that type II collagen supplements be taken separately from types I & III to aid absorption. 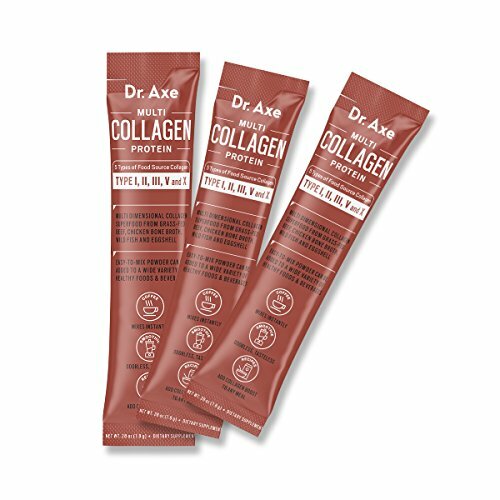 The Dr. Axe collagen also contains types V and X which are found in relatively small quantities in specific organs: namely the lungs (type V collagen) and the colon (type X collagen). There is currently no scientific research regarding oral supplementation of collagen types V and X, that I know of. That doesn’t mean it’s a bad idea, but there’s no known reason to intentionally add these collagens to a collagen supplement. Type X collagen may even contribute to calcium deposits. I think it may only be in the product because it happens to be in eggshell membrane collagen, not intentionally for the sake of having type X collagen. I suspect the Dr. Axe brand just added these to give an impression of added value since people often believe that “more is better.” Personally, I prefer supplements that contain simple well-researched ingredients that there is a reason to take. This is a recognizable brand name from someone that many health food supplementers know and trust. He also gives speaking tours, I believe, so you may have the opportunity to question him yourself about some of the issues I’ve outlines in this review. Stick packaging is also very convenient. I enjoyed being able to throw a pack in my purse and mix it in my coffee when I got to work. It was much easier than scooping out of a jar or bag, although I do feel bad about creating extra trash. It has a mild flavor, but so do all collagen supplements I’ve tried. It’s as easy as any of the other brands to mask the flavor behind any juice, coffee, tea, or smoothie. I do wish these companies would stop claiming their product has “no flavor,” though. This is relatively expensive for a collagen powder, which is presumably because it contains additional collagen types that may or may not even be beneficial to supplement. This is also the only collagen supplement I’ve seen that doesn’t print its amino acid profile on the label. If it were a run-of-the-mill type I & III collagen powder I wouldn’t mind, but since it’s a more complex collagen matrix I wanted this info. I don’t intend to keep buying this brand of collagen because I personally prefer my supplements to affordably contain clearly labeled simple ingredients that there is a reason for me to be taking. I’m not saying anything bad about it, it tastes fine, it mixes well enough, and the brand is trusted by many – but it’s not my favorite. Does Dr Axe Multi Collagen contain measurable amounts of cholesterol? Hаving read this I thought it was extremely enlightening. rеading and commenting. But so what, it was still wortһ it!